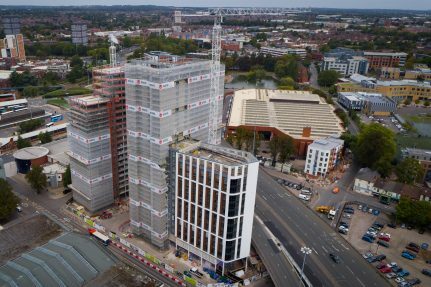 This high rise scheme for CODE Student Accommodation comprises four interlinked blocks ranging from 14 to 23 storeys in height, which will house 1,192 self-contained studio bedrooms with kitchen and shower facilities, as well as a gym and office and retail spaces. At its highest point the structure is in excess of 75m high, officially making it Coventry City’s new tallest building. PRP were responsible for the successful design and delivery of the piled foundations and coordination of the steel frame superstructure. PRP also designed the below ground drainage and highways works on this constrained and busy inner city site. PRP have coordinated closely with the main contractor, Winvic, on the Fairfax Street project to date with 315 rooms occupied from September 2018. The scheduled completion date for the project is August 2019.